Many of the best mobile app experiences are powered by services in the cloud. However, running your own servers can detract from focusing on your client experience. Google App Engine has long been a fantastic platform for mobile developers such as Pulse and SongPop. Now with the Mobile Backend Starter, we've made it even easier for you to get started with App Engine. 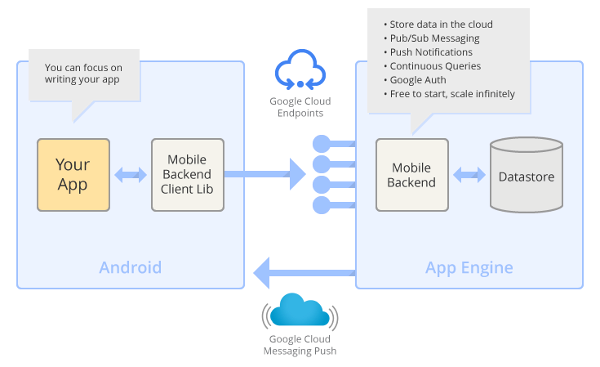 Mobile Backend Starter gives you everything you need to rapidly set up a backend for your app, without needing to write any backend code. It includes a server that stores your data with App Engine and a client library and sample app for Android that make it easy to access that data. You can also add support for Google Cloud Messaging (GCM) and continuous queries that notify your app of events you are interested in. To keep users data secure, Mobile Backend Starter also includes built-in support for Google Authentication. Free to get started, scales effortlessly with your needs: You can start by handling hundreds of users for free, then grow to any scale. First, go to the http://cloud.google.com/console, and create a project. Then click deploy. Click on settings to go to the admin panel for your new backend. Under "Authentication / Authoirzation" select "Open (for development use only)" and save the changes. Next, download the Android client project and open it up in your Android IDE. Locate the Consts.java file and set the PROJECT_ID to the Project ID you created in the Google Cloud Console. Check out the complete docs for details on setup and to find out how to enable authentication, send push notifications, and use standing queries. The best part is you can download the complete source code of the backend on GitHub and customize it to meet your needs.